The end of the year is a great time to reflect on the past and begin planning for success in the New Year. In doing so we find ourselves grateful for the partnerships that make our work possible. For over 54 years, KAC has served the community with a mission to create opportunities for the personal growth and success of people with special needs. Creating employment opportunities has been a cornerstone of services since KAC’s inception. Data demonstrates that people with disabilities are an under employed group at a rate of nearly 50% compared to their same age peers. The positive interpretation of this statistic is that there is an untapped employee pool that exists right in our own backyard and KAC is focused on creating opportunities that work for individuals, business, and the community. Business partnerships enable KAC to offer a wide variety of employment options. 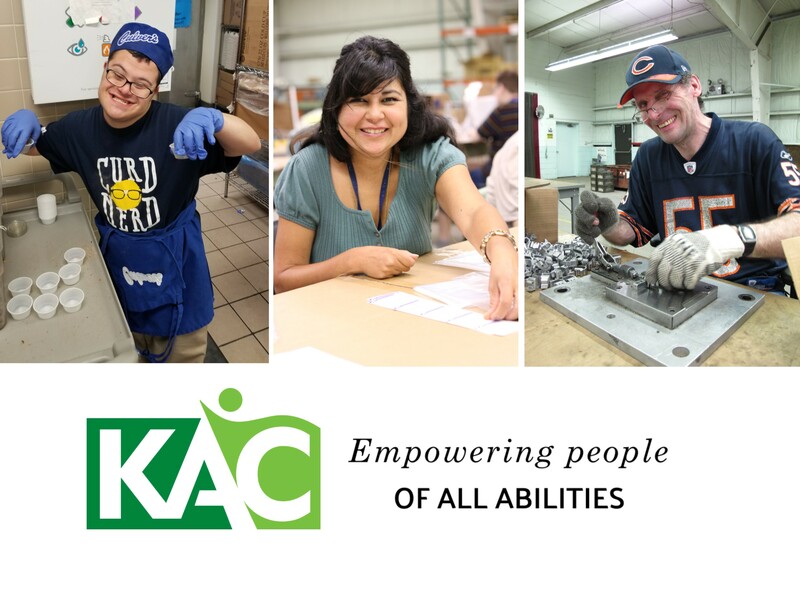 Twenty three businesses, including Snap-on, Rust-Oleum, Quick Cable, and Powerbrace, contract with KAC providing work for more than 100 people with disabilites. This work is done at KAC and involves light assembly and packaging. Food service training is made possible through partners like Wisconian Delectables and Meals on Wheels. Meal preparation and crafting gourmet tortilla chips provide work at KAC for people interested in food service careers. Government partners offer expanded job opportunities in the community. KAC holds State Use contracts with UW-Milwaukee, Department of Corrections, Wisconsin Department of Transportation, WI Department of Military Affairs, and WI State Patrol. These contracts offer work opportunities for 25 individuals with significant disabilities. The work, including meal preparation, grounds keeping and janitorial service, is performed at 5 locations in Milwaukee, Racine, and Kenosha. Companies throughout Kenosha also partner with KAC to fill vacancies in their businesses. In 2017, 64 individuals with disabilities were hired by local partners including Meijer Distribution Center, Festival Foods, and Culver’s. Gina Goldberg, HR manager of Meijer Pleasant Prairie said “My bottom line is hiring individuals of all abilities makes good business sense.” KAC worked with these employers to identify qualified candidates, assist with training, and provided additional support to ensure success. More recently, KAC’s partnerships expanded to include Kenosha schools. Youth with disabilities can begin employment training prior to graduation. School year programs focus on developing soft skills. Students can extend their training by participating in the Summer Employment Exploration program. This 8 week summer program includes 8 different paid work experiences where youth perform real work for local businesses while they discover their strengths and job preferences. The overwhelming response of business partners has made this program a success. Some of our partners include Bristol Oaks Golf Club, Racine Zoo, Pleasant Prairie Public Works, Midwest Therapeutic Riding Center, Kenosha County Courthouse, and Every Childs Place. To partner with KAC visit www.theKAC.com, follow us on Facebook @kac.now, or call us at 262-658-9500. Together we can empower people of all abilities!